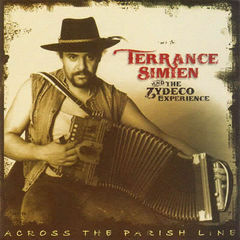 For more than 2 decades Grammy award winning artist Terrance Simien, 8th generation Louisiana Creole has been shattering the myths about what his indigenous Creole Zydeco music is and is not. Leading his Zydeco Experience Band, Simien has become a highly respected, internationally recognized touring and recording artist and Cultural Ambassador for his state. He has presented thousands of performances, toured millions of miles to over 40 countries and reached at least a million people during his eventful 25 year career. Born (appropriately!) in 1965 into the hippie folk and soul music era, Simien grew artistically being influenced by all of the great music that has defined our country’s musical legacy, including music from that era. He was as influenced by Dylan and Simon and Garfunkel as he was by Marvin Gaye, Sam Cooke and the Meters. And of course hailing from one of the first Creole families documented to have settled St. Landry Parish he was deeply affected by the great Zydeco music pioneers like Chenier, Delafose, Chavis, Ardoin and Fontenot to name a few. He counts himself one of the fortunate, as he is the last generation with a direct link to these pioneers, some of whom mentored him as an emerging artist. In turn he has assumed that same role to a new generation of young Zydeco talents as he understands how critical mentoring is to the survival of the music that is so critical to the cultural identity of Louisiana.